Master Chang and the SANGROK Way. 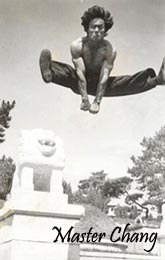 Master Chang started learning Taekwondo at the age of ten. His Master was Lee Jong-woo, who is now vice president of the Kukkiwon. His first teaching job was while he was in the military, where he was the Korean marines Taekwondo instructor and member of their competition team. When he left the military Master Chang opened SANGROK gym in 1979 with the aim of spreading the practice and beliefs of Taekwondo to those outside Korea. While working to achieve that aim Master Chang has taught Taekwondo to students from many countries. He founded Indian Taekwondo and many of his non Korean pupils have opened there own gyms around the world. There are SANGROK gyms in England, Norway, America, Isreal, Gremany and India. Master Chang is 52 looks 32 and moves likes he's 22! He is married with family, who live in the academy as well. He speaks extremely good English and is great company. and is fond of Makgeolli, a traditional Korean rice beer. He is a great man, loved by all his students. 'SANGROK' means an ever-green tree that is always growing and improving. It represents a cycle of constant renewal and growth. Master Chang lives the SANGROK way which contains all the traditional beliefs of Taekwondo, such as respect and etiquette combined with a belief that life is here to be enjoyed. The SANGROK way of Taekwondo believes that promises must be kept and that all are welcome to learn Taekwondo the SANGROK way. The SANGROK way believes that Taekwondo will be with us through out our lives and that we should practice it accordingly. The SANGROK way of Taekwondo offers not only the combination of high energy modern competitive training and traditional style taegeuk poomse, but also a chance to learn firsthand about living the Taekwondo way. opportunity to come to Korea and learn directly from Master Chang. The SANGROK academy is recommended by the Kukkiwon for foreigners who want to come to Korea for Taekwondo training. If you telephone the Kukkiwon and ask about Taekwondo training in Seoul for foreign students, they will recommend SANGROK. Those who come to SANGROK find that not only do they train extremely hard but also that they become quickly accepted in to the SANGROK family. This gives the oppertuntity to experience Korean culture, expereince their way of life and take trips that would other wise be ugifailable to other forgieners in Seoul. Master Chang represents a life time of Taekwondo experience. He is extremely good at taking any students, beginner or instructor to the next level of their Taekwondo. The SANGROK way of Taekwondo is Master Changs fluid, dynamic and unified styles of Taekwondo. He has been developing and thinking about the best way to practice Taekwondo over the past forty years putting him in a postion to anwser any questions about why we do things the way we do in Taekwondo. 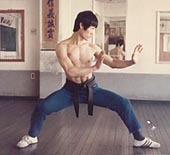 Master Chang understands well both the traditional style of Taekwondo and the modern styes. Master Chang has helped students who have learned the many varied styles of Taekwondo in the world today. Master Chang respects that students have learned differently and because he has been teaching foreigners for so long, is very good at showing them the next step in their Taekwondo. The amount of time that students spend in SANGROK varies hugely. Some students come for periods of over a year, while others come for only a couple of days or few weeks. But many instructors come for a few weeks every year to learn new techniques. Taekwondo teams are very welcome at SANGROK. Students looking to grade in the Kukkiwon must stay for over six months as this is WTF regulations.